LiteXim is hardly a household name but the Aerobuds sound better than their price indicates, and the comfort is on par with true wireless earbuds that cost a lot more. True wireless earbuds are now flooding the market and it seems like almost everyone is making a pair these days, increasing the level of choice for anyone looking to fully cut the cord. While it's a crowded space, the Aerobuds, from a company called LiteXim, are carving out a niche for themselves by being of the affordable variety at only $50 (around £40 / AU$70) and yet manage to stay consistent in ways we didn’t really expect. They sound decent, offer pretty good battery life and are quite comfortable. If you’ve never heard of LiteXim, don’t worry because few actually have. The Chinese company’s pedigree is unknown to most, but everyone likes an underdog, and the Aerobuds are very much fighting their corner. The Aerobuds aren’t flashy, by any means. There’s no eccentric design or treatment to make them stand out. They look and feel ... well, standard for a product in this category. Rounded and contoured in thoughtful ways, however, they’re very light and slim in hand - it’s pretty much all plastic here, so that does help, but as we’ll find out, there’s some durability to note here, too. Like other true wireless earbuds, these come with a charging case, which looks like an oversized capsule, and in comparison to other models on the market, it’s relatively large. We didn’t find it a deal-breaker however, because it's not inconveniently sized and can still easily fit in a pocket. 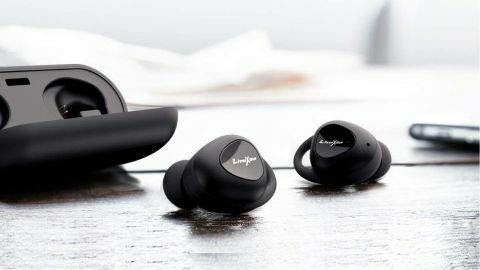 Each earpiece has metal connectors to handle the charge, and LiteXim smartly made them magnetic, so popping them into the case feels effortless - so long as we put them in symmetrically. Red LEDs in the back indicate when both are charging, along with a separate one for the case itself, and when white, the buds are fully charged. The front of the case has a button latch to open them up. Close the lid, and the clicking sound indicates they’re secure. In the box, you get three sizes of eartips (large, medium, small), three sets of wings to help secure them in the ear canal, plus a short microUSB cable for charging. A wax paper insert explains the pairing process, while a small manual guides you through how they work. A QR code was even thrown in for a detailed user guide available online. Bluetooth pairing required us to turn both earpieces on and hold down their respective buttons simultaneously. They appeared on our phone’s Bluetooth list, we selected them, and that was it - so far, so good. An internal voice announces every time they power on, off and have a connection on both sides. Phone calls only route through the right earpiece, where we could accept incoming calls by pressing the multi-function button on the outside. We hung up the same way, and a double-press rejects the call. With music or podcasts, a single-press signals to your device to start playing or pause. Double-pressing skipped a track, but we could never figure out how to repeat one, which is a slight annoyance if you like to listen to the same song over and over again. The detailed user guide offered nothing on that, either, so we’re assuming there’s no way to do it. Not only that, but there’s also no volume control, so we had to handle that through the playback device instead. More often than not, the connection between the two earpieces was stable, but there were times when we experienced dropouts. This affected the left side every time, and usually occurred whenever we placed the phone somewhere with an obstruction. Mind you, this was pretty random as, we found we could be in a different room less than 30 feet away and have no hiccups. Putting the phone in a pocket also sometimes interfered with the connection. It didn’t happen often enough to get annoying, but we found it consistent under specific circumstances. Another technical point that could be an issue for audiophiles is the lack of aptX support. Non-iOS users wouldn’t get the higher Bluetooth quality of that codec, forcing anyone with an Android phone to settle for the lesser SBC (Subband Codec), meaning the audio quality could be compromised. The case has a 500mAh battery inside, good for four total charges, and 16 total hours. The earbuds themselves played audio for about an average of three hours, with LiteXim claiming they are good for four hours, albeit at 50% volume. Since we had to routinely go above that, we experienced closer to three. A full charge through the case took about 90 minutes so we always made a point to keep the case itself fully charged - however, if you’re the forgetful type and tend to leave headphones out of their case, you might want to stick with wired headphones as to avoid the disappointment of picking up the earbuds only to find they're out of juice. Along those lines, we should also point out that the Aerobuds don’t turn on automatically when removed from the case, with both sides needing to be powered on first. Only taking them off, placing them in the case and closing it powers them down. When we first listened to music wearing the Aerobuds, we were surprised at the clarity and balance they put out, particularly for the relatively low price - in terms of audio quality, they don’t sound like budget earphones. Bass was punchy and carried some weight and the highs weren’t super crisp, but were generally fine. The mids were the muddiest of the three, though not detrimental to the wider soundstage, making these a good choice for people who just want to listen to music wirelessly for a good price. Although they may not be suitable for true audiophiles, the Aerobuds exceeded our expectations with a fairly well rounded sound. We tried a variety of tracks and playlists to test the in-ears, including dancehall in the form of Maxi Priest’s Close to You, which sounded full and vibrant, while we found rock music like Led Zeppelin’s Kashmir didn’t feel distantly distorted when pumped up a little. Poppier tracks, like Ed Sheeran’s Shape of You and Promises by Calvin Harris and Sam Smith, came through with good bass. We don’t expect Beats lovers to come away impressed, but everyone else looking for some low end presence might be satisfied. Volume level was another pleasant surprise. The comfortable fit meant we got good passive noise cancellation, trapping the audio in our ears and stopping the sound from leaking and annoying the people around us. That negated the need to raise the volume further, which in turn, helped us conserve battery life. There’s a reason LiteXim ensured that you don’t need to blast your music at high volumes. At a much higher volume — say, about 75-80%— you do get subtle signs of distortion. Nevertheless, the passive noise cancellation was brilliant in noisier environments, with he tight fit keeping A lot of the background noise out, meaning you can listen to your music uninterrupted. We also appreciated that LiteXim used sweat-proof materials to add some durability with an IPX4 rating, making them suitable for wearing during workouts. After wearing them for an hour straight, we were stunned by comfortable they felt, which is often a stumbling block of earphones across the market. It feels as though you get good value for money with the Aerobuds at $50, even if they won’t impress every pair of ears. Their support for AAC makes them interesting alternatives to the Apple AirPods, whereas Android users would be better off looking elsewhere for headphones that support aptX. That being said, they sound better than pairs we have tested that cost more, and seem to have some durability, at least for the short-term. If you care more about branding or demand the best performance, these aren’t for you. But for everyone else? The Aerobuds are probably worth the gamble.